Wishing you all a good year filled with smile in 2012. 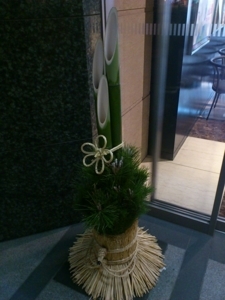 This is Kadomatsu placed in front of the Japan Foundation Headquarters! 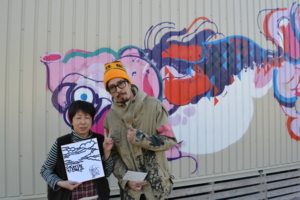 I made an interim report on “Community x Graffiti ＠Ishinomaki” the other day. You are curious how things have gone with it since the last report, aren’t you? So now I’m making a wrap-up report. Here you are! The project was covered by the media, so some of you might have seen it! Surprisingly, Brazilian newspaper as well! 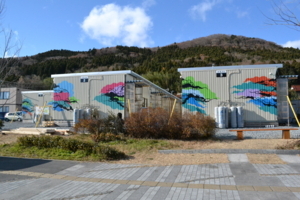 The project is also mentioned on the blog site by the head of Ishinomaki furusato-fukko-kyogikai that supported this project as a co-organizer. 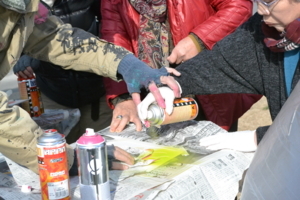 When reported last time, goldfish had been painted at 3 residential complexes, and flowers had at 6 residential complexes, which was the halfway to the goal. 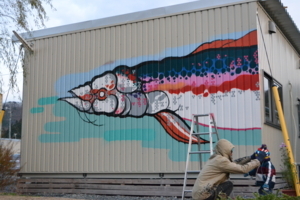 After that, Titi painted a big fish using the walls of two temporary houses at 4 residential complexes and a small fish on the wall of a house (daddy fish and his little kid!). 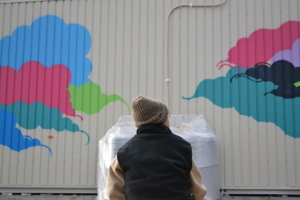 The graffiti of cloud had been drawn at 5 residential complexes. The fish at 4 residential complexes especially caught the residents’ attention. This became a hot issue among the residents. They discussed it every day. 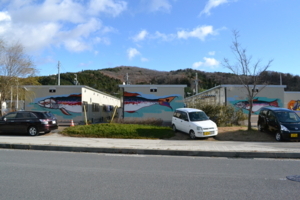 Yes, here is Ishinomaki, a town of fishing harbors. This means a lot of people living here are engaged in the fisheries industry as for instance fishermen. Then it was natural for the residents to discuss what kind of fish had been drawn on the walls of their houses. The majority judged they were salmons. The reason was “lower jaw”! ha ha! 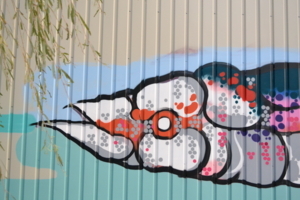 The graffiti really stimulated the residents’ imagination! 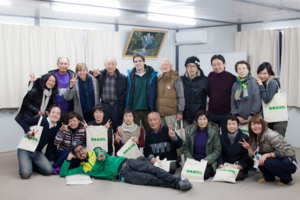 A workshop was also held for the residents on December 10. 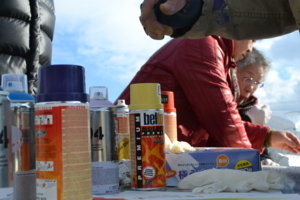 The residents tried to draw graffiti with color sprays usually used by Titi for his works at the workshop. 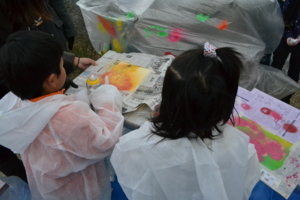 The process was to make patterns with sprays by using paper stencil. This makes it easy for beginners to make beautiful design patterns and express their own creativity with different arrangement and combination. 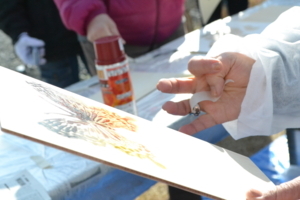 The residents enjoyed making their original graffiti works using a variety of paper stencils and colors!! All the works produced at the workshop were given to the residents as gifts. They brought the graffiti works back home as a memory of time spent with Titi. I hope they have been brightening up the residents’ rooms if only a little! We had a farewell party with the residents at night of December 10, the last day of the project. Titi cried a little bit as the residents having gathered for the party were all compassionate and when he looked back on 10 days spent with them. He looks cool with hip hop style, but actually he has a very warm heart! It had been sooo cold for 10 days! I even felt painful and Titi’s hands hurt because of the cold weather. Honestly, we had many difficulties during the project term. 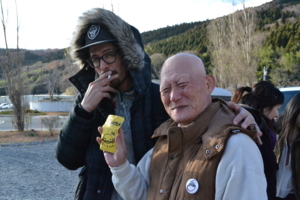 However, the kindness of the residents overcame the difficulties. 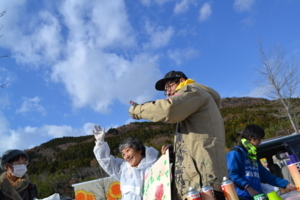 Some visited the working site every day to cheer for us. Some brought us hot drinks, sweets and snacks. Some stopped by to see graffiti drawing and encouraged us with kind words and smiles. 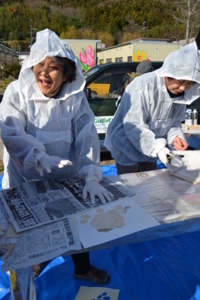 We were supposed to visit Ishinomaki to activate and brighten up the residents’ community, but contrary to the expectation, we were encouraged and empowered by them. On the first day, we came across a double rainbow, and at the last night, we experienced total lunar eclipse. What a miracle! 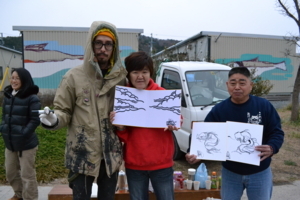 Thank you very much to the people of Ishinomaki Tomorrow Business Town for your support! !